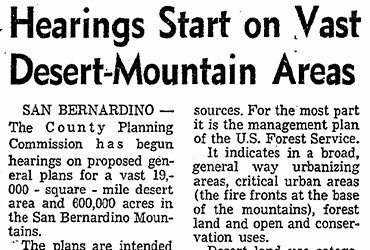 Pioneertown, in the “high desert” above Palm Springs, got its start as a permanent set for cowboy-western movies. About 150 were filmed there, including such classics as “Annie Oakley,” “The Cisco Kid” and the Hopalong Cassidy” series. 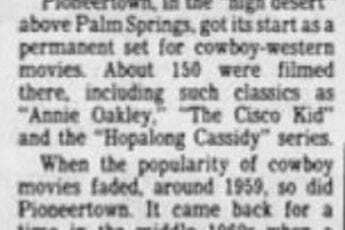 When the popularity or cowboy movies faded, around 1959, so did Pioneertown. 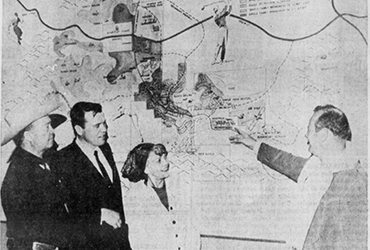 It came back for a time in the middle 1960s when a Cleveland real estate developer, Benton Lefton, bought the town and 20,000 acres around it to create a big resort complex. Water scarcity defeated him at an estimated cost of $10 million. The place went back to being a typically ‘old West’ small town, but has proved popular with tourists. I understand the Pioneertown Palace, recommended by residents for food and drink, really jumps on Saturday nights.